Your hair plays a very vital role in making you feel confident. If your hair looks good, you will look and feel attractive. This is especially true if you like wearing your hair full. Your confidence may be at risk if the hair starts thinning, a phenomenon that is inevitable in many men and women. Eventually, it leads to partial hair loss and finally, balding. No matter how informed you are about balding, you will never get used to it if you previously had thick, bouncy hair. Many products are being created to help you regrow your hair. Some of them are genuine but others are a waste of money. If you do not want to take chances with your looks or your cash, you could invest in something that will guarantee instant visible results—hairpieces for thinning hair. Hairpieces are necessary accessories for people who care about their appearance from top to bottom. This is because your hair is the first thing people notice when they look at your face. There are thousands of hairpiece manufacturers in the market. The secret is to find the one that understands your needs and makes it just the way you want. A great hairpiece can look just like your natural hair and just as comfortable. You do not have to wear a wig when your hair starts thinning—a hairpiece is an awesome alternative that can help you add volume, fullness, and height to your natural hair. Hairpieces can come with multiple pieces that you can place strategically on where your hair is thinning the most—and no one will ever notice the difference. You can attach a larger hairpiece to a tiny base to cover a large thinning area. Some people whose hair is not thinning may also use it to add the length or thickness of their hair whenever they want to go out on a special occasion. Many hair coverage pieces come in the form of wigs, which are great if you want wearable hair to cover total or highly noticeable baldness. A hairpiece is a more comfortable alternative for a wig, as you do not need to wear it to cover your head completely. It covers isolated sections of your head where hair loss is more conspicuous. Bangs and fringes, for instance, provide front coverage and top pieces provide top coverage. Partial top coverage is provided by top pieces with small bases while complete coverage is provided by top pieces with large bases. The most important thing for you would be for the hairpiece to blend in with your natural hair. Most wigs lack this special appeal, as they completely cover your head, leaving natural hair completely concealed out of view. A hairpiece is simply an addition that you snap into place with pressure-sensitive clips. This makes them quick and easy to use. Most hairpieces—both human and synthetic—have a monofilament feature at the base where the hair is parted; this produces the illusion of natural hair growth at the partition. For front hairline coverage, clip-in bangs and fringe hairpieces are an awesome alternative because they provide fuller coverage for an uneven hairline. The easiFringe HD by easihair is one of the brands you might want to check out in this category. Contrary to what many believe, men’s hairpieces are also easy to attach. It may be more difficult for afro-American men, but that type of hair is catered for. The toupee hairpiece can be used by men with all kinds of hair because of the wearable style the piece comes with. 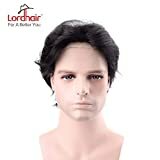 100% Human hair mens toupee for men,Med-light density, free style, 5"~6" length (Strech it to be straight hair and then measure). Natural men human hair line with Single and light bleached knots, looks natural and experienced durability! The toupee for men with a cap, there is no need for you to wear another cap, could be wear directly with walker tape. 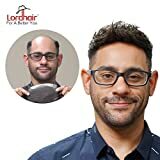 This hairpiece provides a larger base, which gives extra coverage to your thinning hair; blending with your natural hair becomes less challenging with this piece. These hairpieces come in a variety of hair types, colors, lengths and base sizes. You might want to choose whether you want a synthetic hairpiece or one that is made out of human hair. Wearing a hairpiece can be the best decision you would ever make personally and professionally if you want to improve your appearance. You can wear a hairpiece every day of the week due to the comfort they provide in comparison to other alternatives such as wigs. Nowadays, it is difficult to tell whether a person is wearing a hairpiece unless they tell you. Most people will always wonder how you can manage to maintain such hair when if you are older. Some hairpieces come with a conservative look, which is perfect for business people. These are also extremely easy to attach since a businessperson would not want to waste time fixing hair. Many hairpieces are easy to fix as well as remove. However, you want a piece that will not come out at the slightest hint of breeze. It would be horribly embarrassing if it comes off in the middle of the street or an important meeting. Over the years, manufacturers have discovered new ways to make their products difficult to detach since many people complained. Some of the hairpieces featured here may have some cons, but it is advisable to find one that fits your needs exactly. You can always request for another piece if the one you bought had some shortcomings. If there is still a problem, try another brand from a different company until you get the most suitable one for you or look into tips for treating thinning hair. Due to chemo my top hair came out and wont grow back. 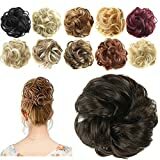 What kind of hair piece can I buy since there is noting on top to clip hairpiece to?